Home › Teaching & Learning › Do elite colleges discriminate against Asians? Visit any suburban high school and talk to some seniors. 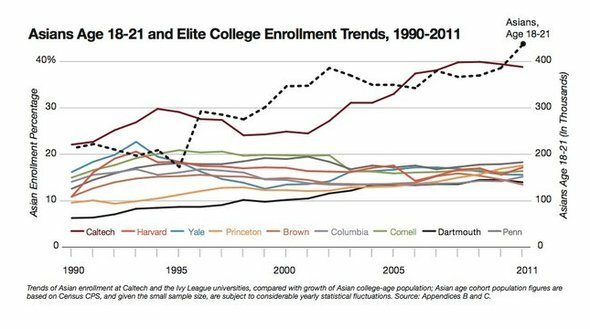 You’ll be convinced that most of the Asian-Americans are shoo-ins for admission to elite colleges: either they’ve already been admitted or else they surely will be by April. That’s the stereotype, at any rate. An upper-middle class Asian with perfect grades who plays piano and violin, wants to study pre-medicine or computer science, and has parents who are dentists or engineers, too… simply does not stand out. Clearly Harvard is not alone. The other Ivies are right in line with Harvard, and only Cal Tech admits Asians in rough proportion to their presence in the population. What do you think? Do the Ivies have an Asian quota?